By Mark - Peru - 21 Dec/02 - Viewed 2053 times. We decided to do the Inca Trail with SAS. They are one of the most expensive at S/.852.60 each but they are supposed to be the best. We had to be at their offices at 5am on day 1, and shortly after we left by coach. It took about three hours to get to the train station at km 82 where the trail starts. By the time we got here, the porters had already laid out breakfast on a portable picnic table and we met the rest of our group for the first time. Apart from us there were three English people travelling together, two New Zealanders and a German. We had a guide called Marcelo. SAS also had another group that was twice as big with two guides but we were kept completely separate. We had nine porters and a cook for our group who carried everything except our personal stuff - tents, cooking equipment, food, tables and chairs. It is amazing how fast they go, even uphill with up to 25 kilograms on their backs. The porters race the ones from other companies so they can get the best campsites. They leave the campsite after you, run past and have everything set up by the time you get to the next place. The first morning was fairly easy with only a few uphills and spectacular scenery and we walked as a group. We passed an impressive Inca citadel called Llactapata and Marcelo told us a bit about the Incas. We passed a sheep riding a horse (honestly - see the photo). Shortly afterwards we got to the lunch site where they had already set up a large tent with table and chairs in to eat. I was expecting sandwiches, but we had an excellent three course meal with garlic bread to start. Impressive for a restaurant let alone a camping stove. The afternoon was up a gently sloping valley to the campsite. All the groups camp in different places on the first night and ours was in a field behind a farm at the bottom of the big day 2 climb. We got there about 3.30pm and relaxed watching the mist drift up the valley. It was exactly how you imagine Peru to be. At 4pm we had an unexpected tea with popcorn and biscuits. Soon it started raining so we sat in the big tent until dinner - another three course meal. Whatever else happened we weren't going to starve. We played games until 9pm and went to bed. We had good dome tents which had been set up for us. The next day we got up at 5.30am and had breakfast of pancakes and porridge. Then we started the long climb up to the first pass - 1200 vertical metres above. It takes about four hours of continuous walking up steep slopes and steps. Some of our group hired porters for the day to carry their backpacks (S/.30.00 each). These day porters turned out to be fifteen year old girls from the village. Soon after starting we were walking through beautiful cloud forest. The going was very hard, especially where there were steep steps. After two and a half hours we were finding it tough going and eventually made it to the lunch place last in our group just as it started raining. Luckily they had set up the big tent to eat lunch in - SAS were the only company to do this and everyone else got wet. As soon as we finished it stopped raining and we started the final climb. We found it much easier after lunch and got to the top in good time. It was very cold and we couldn't see much because we were in the clouds. This is the highest point of the Inca Trail at 4198m. Feeling good after reaching the top we almost ran down the other side, it only took an hour to desend to the campsite at 3600m which we reached about 1pm. The campsite was on a hillside in a cloud forest with amazing views over a valley. We then had the afternoon to relax before another tea and dinner. After dinner they gave us some traditional Peruvian mulled wine and a bottle of rum to mix it with. Even so, we were in bed by 9pm. We got up at 4.30am for the longest day. Although not as steep as yesterday, there were two passes to climb and 16km to walk in total. The first pass at 3900m was straight above the campsite. There was a small Inca ruin and a couple of lakes, from here we could see the whole valley and the pass we climbed yesterday on the other side. After that the path went down to a bigger ruin called Sayacmarka that was built precariously on the top of a mountain. Another few hours and we started to climb to the second pass of the day. It wasn't steep but there were many false summits and we kept thinking we were there when we weren't. Eventually we reached it and had lunch on the summit. Once again it started raining just as we got there. Immediately below the pass there was another good Inca ruin called Phutyupatamarka with lots of steep steps. It was shrouded in cloud and look mysterious. We still had a long afternoon ahead of us and although the going was flat and downhill we were soon tired. It started raining and we found it harder going than day 2. We were now on an original Inca path, laid with stone and often cut into the side of the mountain with huge drops on one side. At some points there were long original step sections. After a while we came to a view point looking over the valley that Machu Picchu is in - you can't see it from here though because there is another mountain in the way. You could see Aguas Calienties and the railway though. It seemed like forever before we got to the final descent to the campsite - an endless series of zigzags leading down. We were getting slower and slower and finally got to the campsite about 4pm - a long day after a 5.30am start. There were some really good ruins nearby called Wi�aywayna with impressive terracing cut into a very steep mountain - they were only discovered recently. The third campsite is situated round a restaurant where we would eat that evening. This is the last night before Machu Picchu which is only two hours away so there was a feeling of celebration. Beer could be bought in the restaurant and our porters had staked out a table for us. They brought us popcorn and apple turnovers and we relaxed. There are also hot showers for S/.5.00. All the other groups camp around the restaurant too (about 15 when we were there, about half of capacity) and soon it was busy and lively. The porters served us dinner in the restaurant and afterwards they all came in so we could thank them and give them their tip. They don't go to Machu Picchu so the last we would see them was in the morning. After dinner there was music and the other SAS group danced embarasingly. At 10.30pm we all went to bed. We got up at 4am the following morning and left while it was still dark. After two hours and some very steep steps we reached the Gateway of the Sun. This is the last pass and in theory you can see Machu Picchu from here when the sun rises. It was too misty though so we started walking down. After fifteen minutes or so, the mist thined and we could see the sun rise over the mountains. We could just make out bits of Machu Picchu and by the time we reached the point where the Inca Trail ends and the terracing begins bits kept appearing and disappearing out of the mist. We went down to the main entrance and checked in our bags and bought a coke and some chocolate. The sun was out now and we went to have our first proper look at Macchu Picchu - it was even more stunning than we expected. For the next two hours Marcelo took us all round the site showing us everything and explaining what each part was used for. Then we had free time to look around and make our way back to Aguas Calientes for lunch at 2.30pm. Most of our group decided to climb Wayna Picchu, the mountain behind Machu Picchu. Looking at it it didn't seem possible that there could be a way up something so steep. There seemed to be more people going up than down which was a bit worrying. I only went as far as the terracing on the top - about 30m from the summit - it is far to scarey above that as there are no trees and too much open space. It took about 30 minutes and was a very enjoyable climb, it was very steep with steps cut into the rock by the Incas - it is amazing how they built their trails up seeming impossibly steep mountains. The drops on one side were ridiculous and I had to focus on the steps and not look down. The view of Machu Picchu from this side is one I hadn't seen in photos - it is less impressive because it doesn't seem to jut out into space but instead is on the side of a mountain, but you get a better overall view and can see all the terracing that is normally behind your viewpoint. Afterwards, we looked around some more and then got the bus down (S/.17.40 is very expensive but it takes and hour to walk and we wanted as much time as possible). I could have spent another day there, but some people were bored by lunchtime. We had opted to stay the night in Aguas Calientes and get the 6am train back in the morning - this costs no extra as the afternoon train is much more expensive. You stay in an SAS owned hotel and get dinner and breakfast included. The morning train only goes as far as Ollantaytambo instead of Cusco, but this gave us an opportunity to see the ruins there. They are quite different from Machu Picchu and impressive in their own way - huge perfectly cut stones fitted together without the slightest gap. We had to get the bus to Urubamba and then Cusco, costing S/.4.00 each in total. We finally got back about midday, tired but happy. It was an amazing trip and we had a really good group that got on very well. The guide was excellent and we couldn't have been looked after better by SAS. That night we went out on the town with some people from our group and went from bar to bar getting free drinks (most bars give you a rum and coke as your first drink). The discos go all night but we only managed until 3.30am. We needed a serious sleep after all that getting up before 5am. The tour company we did the trek with. 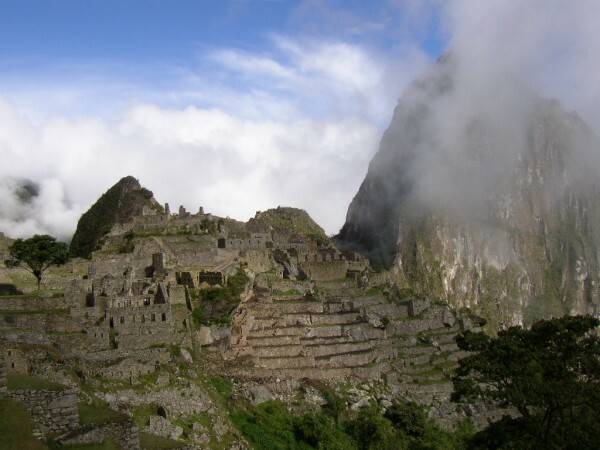 Lots of links to Machu Picchu related sites but nothing else.